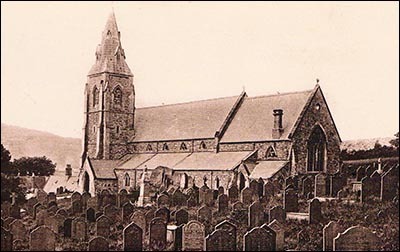 Christ Church, built as the parish church of Glanogwen, was consecrated in 1856 and retains its original stalls with ornate “poppyhead” ends. It was designed by Thomas Henry Wyatt after a collection raised enough money, including £500 from parishioners and £2,000 from Colonel Douglas Pennant of Penrhyn Castle. He also donated the site. Lady Louisa Douglas-Pennant, his second wife, laid the foundation stone. On 31 December each year, from 11.30am to 11.55pm the church bells tolled mournfully for the dying year – then changed at 12am to a joyful peal for the new year! In 1859 Queen Victoria gave the Choral Society of the Penrhyn Slate Quarries an engraved silver cup, after the choir sang for her and Prince Albert at Penrhyn Castle. The vicar of Glanogwen rotated the cup annually around the four local churches. An annual tea was provided for Christ Church’s own large choir. In January 1863 the choristers sat down to beef, plum pudding and cwrw da (good beer). However, cwrw da sometimes caused problems, as when a “tipsy” Irishman stumbled into a service in 1864 and tried to give his own responses to the Litany. Police hastily removed him! In 1875 vicar John Morgan was embroiled in a conflict with residents who wanted burial fees reduced and fixed. In March the father-in-law of one of the prime movers in this dispute died, and trouble flared immediately. Friends of the deceased placed brickwork in the grave without Rev Morgan’s permission, who in retaliation threatened to destroy it. During the funeral, with police in attendance, Rev Morgan threw the burial money down and refused to allow the coffin to be lowered into the grave until the whole fee was paid. There was “an unseemly wrangle over the corpse”. Rev Morgan eventually started court action, and it was claimed (although denied by quarrymen) that the dispute was a way of “punishing the parsons” for supporting the employers’ cause in the 1874 Penrhyn quarry strike. A memorial tablet to the Rev Morgan was prepared as part of the church’s renovation in 1906. Shortly before the church reopened, a gas explosion badly damaged the floors in the clergy and choir vestries, blew two of the windows completely away and cracked the “beautiful east window”.